For more than fifty years, squirrels have adorned our lives and been seen as cute, cuddly creatures that have done everything from saving the world from evil villains in the Rocky and Bullwinkle show to being friends with the loveable and quirky SpongeBob Squarepants. 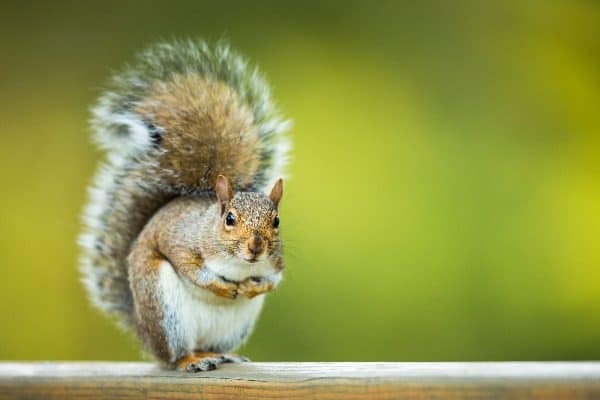 However, the reality is that squirrels are not only a nuisance for those that like to feed birds in their backyards but carriers of deadly diseases like the Hantavirus and plague. If you enjoy feeding birds in your garden but are having problems keeping these pesky creatures away here are several simple tips for how to keep squirrels away from bird feeders. We’re also going to find the best squirrel proof bird feeder and look into squirrel proof bird feeder poles. Unfortunately, the best kinds of birdseed, like black oil sunflower seeds, suet, and nut, are just as loved by squirrels as they are the birds, like the English Sparrow, you are trying to feed. 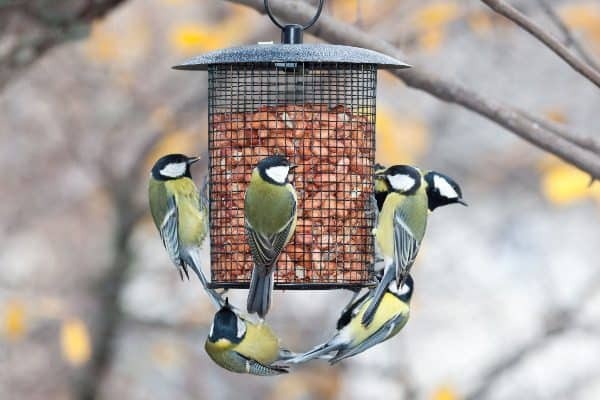 If you have become frustrated with trying to keep squirrels from devouring the seeds you leave out for the birds, there are several ways to squirrel-proof your backyard bird feeder, from purchasing specialized feeders to quick and easy ways to deter the pesky rodents. To keep your bird seed from being feasted on by squirrels, the best deterrent is using a squirrel proof bird feeder. There are several different types you can purchase, from weight activated, to cage covered. Like with any product, some will last longer than others and have better features. It is necessary for you to do your due diligence to decide which feeder will work best for you. Here are some of the best bird feeders to purchase to keep squirrels from feasting on your backyard bird’s food. Each of these bird feeders denies squirrels access to the bird food by shutting down the seed ports so these pesky creatures can no longer access the treats inside. Adding hot spices, like cayenne pepper, to the bird food has been shown to deter squirrels. The great thing about this method is it doesn’t harm the birds in any way because they are immune to the effects of the taste of the spice. Because birds don’t have the receptors to taste the capsaicin, which is the compound that puts the heat in the peppers, they don’t have issues when they eat it. Using a motion-activated sprinkler that deters not only squirrels, but some other animals like deer, raccoons, rabbits, skunks, geese, and other small animals. These work by using a motion sensor to detect animals, instantly spraying the animal with water when motion is detected. There are several different squirrel repellents that you can make at home that will help keep squirrels away from your bird feeder and any other area where they have become a nuisance, like your flower garden or patio. Fill a pot with the water, onions, jalapeno, and cayenne pepper. Using a strainer, strain the vegetables out of the liquid. Pour liquid into a spray bottle. Using the spray bottle, spray the pepper spray everywhere where you want to keep squirrels from getting into, like your screened-in porch, flower beds, and bird feeder. See below for directions to make an effective dry squirrel repellent. 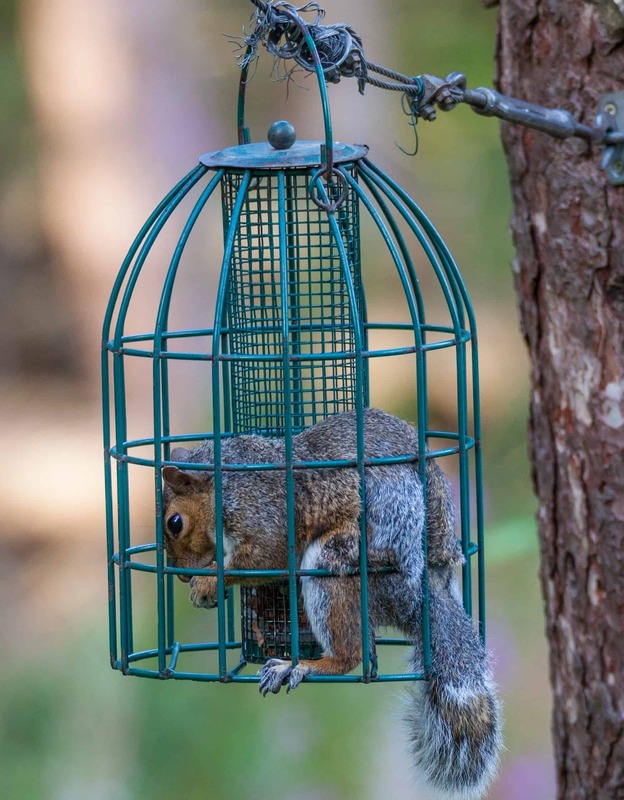 To assist your efforts in preventing squirrels from getting into your bird feeder, you can squirrel proof bird feeder pole by installing a baffle to the top of the feeder if it is hanging from a wire or chain, or at the bottom of the feeder if you mount it on a post. You typically make baffles out of a plastic bowl or polished metal, and you can purchase them from any home improvement store or online retailer like Amazon. You can also make your baffle by following the steps below. Firmly clamp the end cap with a vise or pliers. Using a hole saw or drill bit, drill a hole into the center of the end cap. Fasten the stove pipe together and place it inside the end cap. Carefully lay the stovepipe on its side. Using a drill, create pilot holes through the sides of the end cap. Make sure they pierce both the end cap and the stovepipe. Screw in sheet metal screws. Slip the bird feeder pole through the hole you made in the end cap. Mark the feeder pole at the top of the baffle. The mark should be about four to five feet off the ground. Attach the hose clamp to the pole at your mark. Slide the baffle back over the pole, so it is resting on the hose clamp. 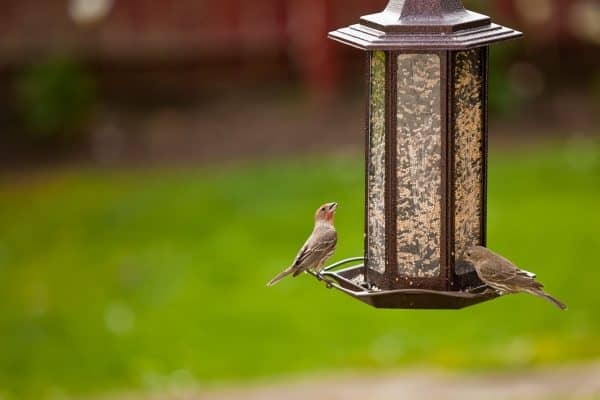 When placing your bird feeder, make sure it is situated at least five feet from the ground and at least twelve feet from any structure, to help keep them out of your bird feeder. You may also want to consider purchasing a squirrel stopper pole, a specialized bird feeder pole that is squirrel proof and strategically placing it in your yard. When filling your bird feeder, try and stay away from the kinds of foods that squirrels enjoy eating like, black oil sunflower seeds, suet, and nut. 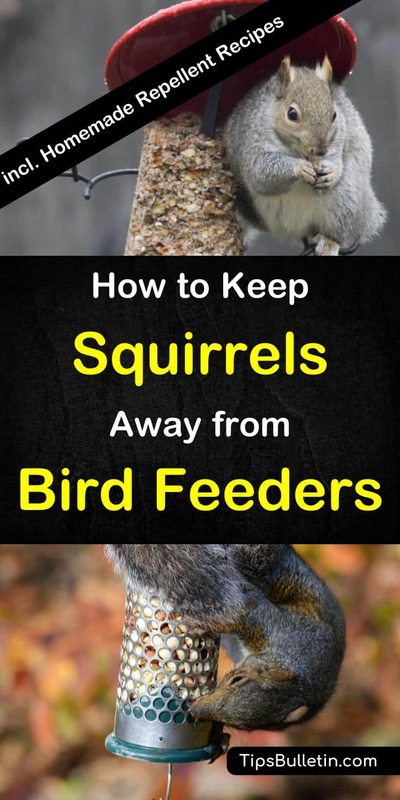 Instead, fill the feeder with foods that squirrels dislike. These are the types of foods that squirrels will typically avoid eating, making them great options for filling your bird feeder and keeping the squirrels from using it as their buffet. If you want to keep squirrels and other animals out of your bird feeder, you may want to consider using a platform feeder. Not only do they keep squirrels from getting to the bird seed, but they allow you to place table scraps, like bread and vegetable trimmings, on the platform for birds to eat. If your bird feeder hangs from a tall metal pole in your yard, you can use grease to keep them from getting into the feeder and driving the birds away. Using a cooking oil like Crisco, coat the entire pole to help keep squirrels from climbing the pole. The grease makes it hard for the squirrels to climb the pole and they will decide getting to the bird seed isn’t worth trying the effort. You can try distracting the squirrels by placing a decoy in your yard. Take a squirrel feeder and put some corn or other food that squirrels like into the feeder to keep them occupied and away from the bird food. Hanging some suet in a small wire cage in the tree can also deter squirrels. Cage covered bird feeder do not always guarantee squirrel protection. You can keep squirrels out of your bird feeder by placing a wire cage around the feeder. As you can see in the picture next, cage covered bird feeders do not always provide sufficient protection. Make sure that the openings in the cage are small enough that the squirrels can’t get through but big enough to allow birds entry. If you become desperate, you can also place traps around the bird feeder to capture the nuisances so you can relocate them. Contact your local wildlife control office to find out the best way to set traps to catch the squirrels humanely. Here are some more useful recipes you can make at home that will help keep pesky squirrels from invading your yard and devouring your bird seed. Sprinkle in areas you want to deter squirrels. Dice the onion and put it in a medium saucepan. Add one cup water to the pot. Bring the contents to a boil. Cook over medium-high heat for ten minutes. Strain the ingredients, discarding the onion. Pour the water into a bucket and add another gallon of water. Add the liquid dish soap and Tabasco sauce. Pour into a large spray bottle. Spray the mixture wherever squirrels have become a problem. In their efforts to get to the bird seed, squirrels will claw and chew their way through anything, often damaging everything in their path. We’ve provided you with numerous ways to keep squirrels away from the bird feeder along with some excellent squirrel repellent recipes that you can make at home. 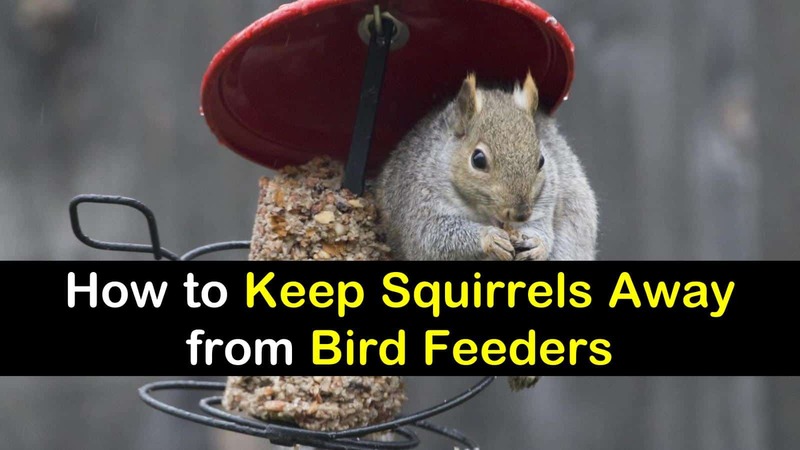 These simple solutions for keeping squirrels away from your bird feeder will allow you to enjoy feeding the birds without the nuisance of these pesky rodents. In this article, we went over how to keep squirrels away from bird feeders. We’ve explored the best squirrel proof bird feeder and looked into squirrel proof bird feeder poles. We hope you found some useful information in this article, and as always if you know someone who can benefit from these tips, please feel free to share.